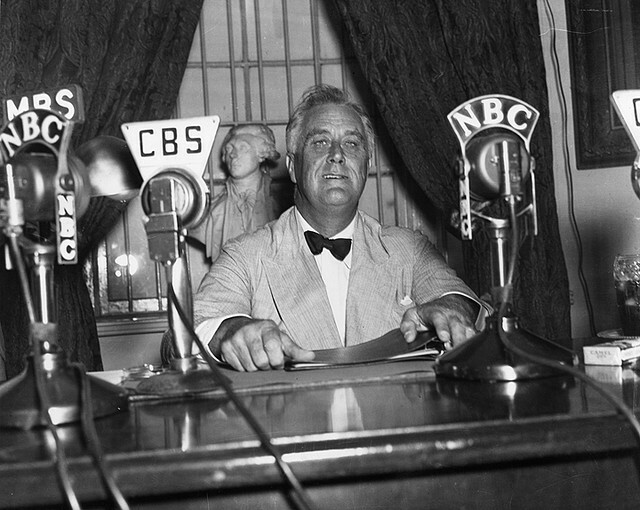 You are here: Home / Changing minds / What Would FDR Do? We usually think of politics in communities in two ways: as the “big-P” politics of campaigns and referendums—noisy, zero-sum contests that get lots of public attention—and the “small-P” politics of gaining approval for policies and projects. These are the non-zero-sum contests of compromise and tradeoffs that revolve around regulatory approvals, planning board and city council votes, and the occasional state law. But how, exactly, do you mold public sentiment? And are most civic leaders good at it? The answer to the second question is no. The answer to the first can best be understood by turning to another president, Franklin D. Roosevelt, who, second only to Lincoln, was the greatest molder of public opinion ever to occupy the White House. Roosevelt’s masterpiece was changing American attitudes about involvement in World War II. Yes, Pearl Harbor was the defining moment, but by December 1941 public opinion had already changed greatly, as Lynne Olson tells us in her recent book, “Those Angry Days.” And that was Roosevelt’s work. So what did FDR do? He bided his time (to the despair of the increasingly desperate British) as he set in motion several forces that changed public opinion. The most important: He quietly encouraged nonpartisan citizens’ groups to begin campaigning for American support for the Allies. Then Roosevelt (to all appearances) gradually acceded to their demands, first in asking for changes in the neutrality act, then in offering more generous aid to the British, then in lobbying for a buildup of the military, and finally in asking Congress for a peacetime draft. It was a step-by-step process that took two years’ time, with Roosevelt never more than a half-step in front of the public. Today we would call this “leading from behind”: letting others be the point people for change as you remain in the background. It requires a secure person to lead this way. Secure in two ways: First, emotionally secure enough to let others occupy the spotlight. Second, secure in the messiness but ultimate utility of public debate. Does this diminish your reputation by making you look indecisive? Well, Roosevelt was accused of that in 1940 and 1941. But reach in your pocket and pull out a dime. Which leader’s face do you find? Roosevelt’s or one of his critics’? Photo by UNC Greensboro Special Collections and University Archives licensed under Creative Commons.